Well, things have definitely changed in the last few day of our trip--not badly but different. First the temperature is different. Heading away from the coast has warmed us up considerably and there isn't the chilly winds coming off the bay either. 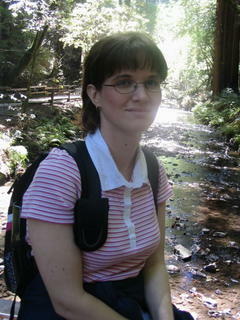 We headed over the Golden Gate bridge on Sunday and spent the day at Muir Woods park. 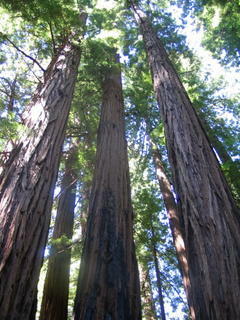 It is full of sequoia redwood trees and is a very tranquil and peaceful spot. When we got into the park, I noticed a strange sign. You can see by my quizzical expression that I don't really know what is going on here. The sign says: "This area has been set aside for individuals or groups exercising their constitutional first amendment rights. The National Parks Service neither encourages or discourages, or otherwise endorses these activities and receives no funds in relation to these activities." I thought of Sven Golly when I first saw this sign and wondered if he had an answer for who might use this spot, conveniently located near the bathrooms, to practice their rights. Stay tuned for the compelling answer. Once we made it past that political hotbed, we got into the park. The trees here are amazing. 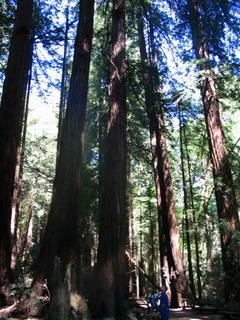 I have always wanted to see redwoods and I was really relaxed walking through this place. This place really is quiet, but it isn't muggy like some forests. It is almost entirely silent (aside from the many people walking through the paths and trails). Most of the animals are active at night when all the people have gone away. To give some sense of scale, I am the small blue figure at the base of that tree. Here is my beautiful bride; we really enjoy the tranquility of this place and spent about two hours wandering around, taking our time. Part of that was due to my ankle hurting a bit, but mostly because this place just demands that you slow down and look. 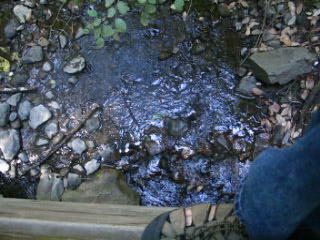 This was a small video that I took of the Redwood Creek that runs through this part of the forest. I don't think you will be able to activate the actual video here, but if you could, you would hear about ten seconds of water bubbling over rocks. It reminded me very forcefully of many camping trips that I took as a kid. I love the sound of small creeks. 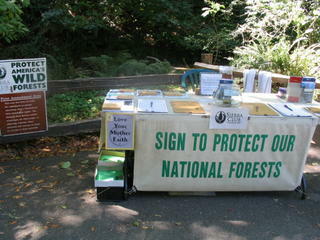 The Sierra Club was hard at work getting the word out about the need to conserve nature. Good for them. 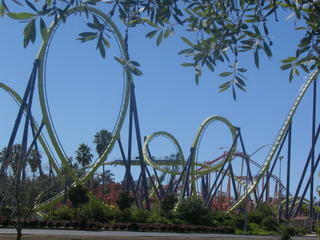 We are across the street from Six Flags Marine World. Our hotel is much more normal than the swankier place that we enjoyed immensely in Fisherman's Wharf . . . but it is cheaper. Today we drove into the Napa Valley and tried to do the wine-tasting thing. We found out that it wasn't really something we cared that much about. We stopped into one winery and tried some sips of some red wines. We talked to the person working there and paid our wine-tasting fee ($10 each!). It's just not that big a deal, to us and we've spent more than enough on this trip as it is. We have really enjoyed our time in California and really enjoyed the time in San Francisco, the variety of people and nationalities around us, the wonderful food, the gorgeous scenery, and most of all our time together to relax. But we will be glad to be home with the girls soon. Tomorrow we are back in San Francisco and grabbing a very early flight on Wednesday morning. We haven't yet decided what we will do tomorrow morning. Tomorrow I'll post the pictures we took driving around Napa. 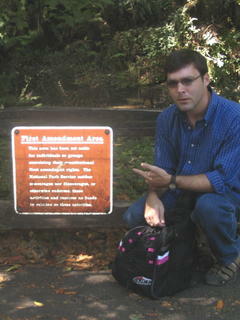 Is there a touch of dark humor in the sign designating the official free speech zone? Kind of like the boundaries around any park, wildlife preserve, or 'natural area'. Maybe we should erect signs in populated places: Now entering Free Speech Zone...Now leaving Free Speech Zone...Now entering Nature...Now leaving Nature. The photos are awesome, and clearly you two were in the presence of something great.